The firestorm surrounding President Donald Trump’s pick for the Supreme Court over the nominee’s behavior in the 1980s has reinforced a warning today’s social media-savvy high school students have grown up hearing: What they say and do now will live well past graduation. 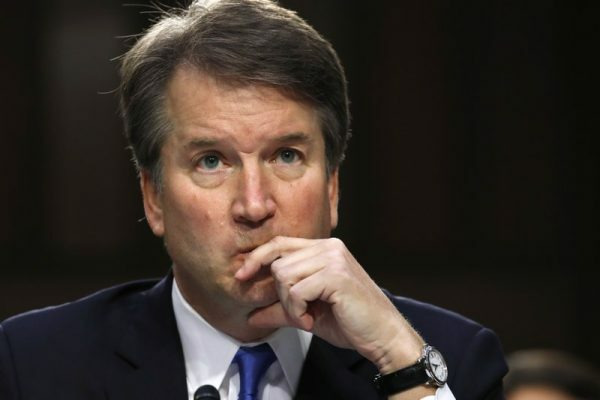 Judge Brett Kavanaugh faces a historic hearing Thursday over assault allegations dating back to his high school and college years. He has denied the allegations. Some teenagers today say they are more mindful of the enduring quality of their words and actions because they’ve grown up with the internet and social media posts are increasingly part of the college admission and job vetting process. In contrast, the evidence collected in the Kavanaugh’s past includes decades-old yearbooks and calendars. California high school senior Maya Carpenter, 17, says she’s taken classes since middle school on being safe on the internet, and her high school offers a digital citizenship class on the subject. At least 10 prospective Harvard University students learned this lesson the hard way last year when their dream school rescinded admission offers after they traded posts on Facebook that were reportedly often sexually explicit and mocked Mexicans, the Holocaust, sexual assault and child abuse. Colleges also make no secret of the fact they visit applicants’ social media profiles. A Kaplan Test Prep survey in April said 68 percent of colleges consider profiles on Facebook and Instagram “fair game” as they decide who gets admitted. A big difference today — it’s unlikely to take 30 years for misconduct to cause problems. “It’s definitely something that a lot of people are aware of,” said Georgia VanDerwater, 18, of Holland, New York. She is cautious about what she posts online, and even her mother keeps tabs on her social media posts and messages when she sees something that could be troublesome down the road. “Be it a joke or a swear word in a tweet, I send it back. I will write and say, ’I just want you to know that when I read this I interpreted it this way, and so other people might interpret it this way,’” said Georgia’s mother, Amy VanDerwater. Bob Farrace, spokesman for the National Association of Secondary School Principals, says schools have been steering students toward more constructive yearbook posts for years. But it’s not just bad acts that live on. VanDerwater, a freshman at the State University of New York at Geneseo, knows that if a potential employer Googles her name, they’ll see that she helped organize a high school walkout last year to demonstrate for stricter gun control, and that she called out a Republican congressman for not taking part in a forum on the topic. As she got involved with gun protests, she had to weigh whether that political activity might work against her if she tries getting a job with an employer with different political views. In the end, she decided it was worth it because a company like that wasn’t a right fit anyway.